Tok Panjang – tok meaning “table” in Hokkien and panjang meaning “long” in Malay – otherwise known as “long table”, is a very elaborate feast traditionally whipped up for weddings and special occasions. 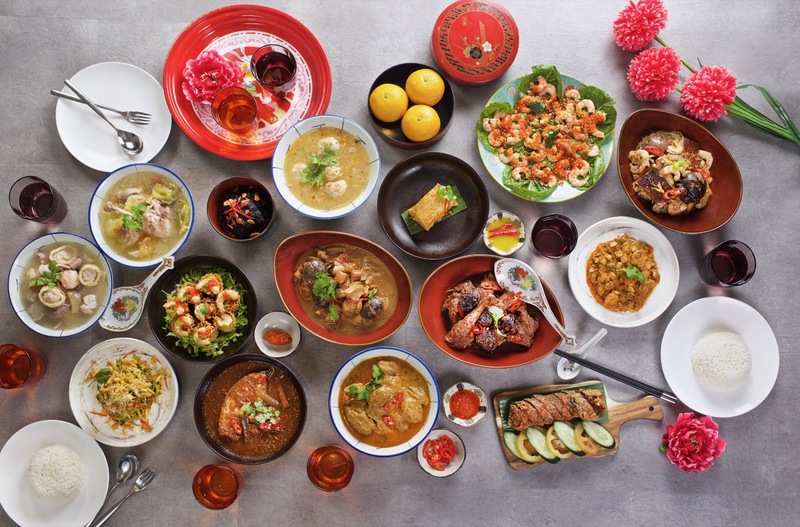 The Peranakans are a tight bunch, and Tok Panjang is their way of bringing family together to eat and keeping the culture alive. Folklore’s Damian D’Silva has fond memories of this custom. His grandmother would cook up a storm of 20 dishes, mostly a collection of family favourites. Everything is prepared from scratch as far ahead as two months, and Damian, as a kid, would offer to chip in, whether it is to pickle the achar or have a whack at dessert. If you have the stamina to eat, take your family and friends to Folklore anytime from 15th February to 2nd March. Tok Panjang will be on the menu, featuring a mix of regular items and dishes made specially for this Chinese New Year. Including dessert, there will be 17 dishes to go round. A few of our favourites include the itek teem, a shredded duck and salted vegetable soup; the kueh pie tee, crispy cups of of shredded turnip, bamboo shoot, pork, garlic and soya bean paste; the garang assam, spicy-sour red snapper and eggplant; and the sambal belimbing, a refreshing plate of mini starfruit and sambal. Part Peranakan, part old-school coffee joint and part modern eclectic, Folklore is as welcoming as it seems. Casually stroll in and slip into any of the booths without feeling judged. Waiters are friendly and they should make you feel right at home, as if you’re at grandma’s. Run by the PS. Cafe group, you’d imagine guests to come here for the ambience and not so much the food. Not true. In fact, we gave the upcoming Chinese New Year ala carte menu a shot and we were pleasantly surprised. Generally known for its American Chinese cuisine, such as prawn toast, the Chinese New Year menu (5th February to 2nd March) veers slightly more towards Chinese and interestingly, Thai. Get the Lucky Lunar Lo Hei, which comes with cured trout, kale, celeriac, sprouts, red radish, blueberries, wild rice and a zesty dressing. Not very traditional, we know, but would you believe that it tastes better than usual? Others to take note: the Lemongrass and Lime Poached Barramundi, Crisped Garlic Spare Ribs and Tajima Beef Fried Rice that’s been tossed in wagyu drippings. If you’re eager to wash the fat down, there’s the Lucky Puppy, a potent concoction of whisky, vermouth and Cointreau. Although obviously kitted for the bored expat housewife, there is a lot to like about Chopsuey. The snazzy black and white decor, the right amount of sunshine and perhaps the fact that no matter how overwhelmingly busy it can get, your words will hardly drown in noise. If you’re part of a big family that’s a stickler for tradition, go straight to Cherry Garden. Tucked away in a hotel, this restaurant focuses on the traditional and rather lavish set menus that the old-school Chinese are fond of. There are seven sets in total. One named “Harmony”, one named “Success” and another, “Joyous”. Pen Cai (a pot stuffed silly with abalone, lobster, scallops and more) is usually a given, but keep an eye out for others like the Double-Boiled Spring Chicken Soup, Baked King Prawn and Steamed Dragon Spot Garoupa. If you’d like to take away instead, there’s a separate menu featuring beef brisket and charcoal-roasted duck. Carpeted floors, and elegant wooden furnishings with fancy china. You get the picture. It is Mandarin Oriental after all. Oxley Tower on Robinson road has a new resident. Myo Restobar, a recent project launched by the Kia Hiang Group, comes as a reincarnation of one of Singapore’s oldest eateries (that’s Kia Hiang at International Plaza). Armed with over 40 years of heritage, Myo’s menu is palimpsest, revealing some of Kia Hiang’s bestsellers, brand-new items and a very elaborate menu just for the next month. The unassumingly named Claypot Chicken is a must. Wrapped in cabbage and cooked into a sticky stew, it is savoury, sweet and best eaten with rice. It’s a crowd favourite, but don’t stop at there. The Salted Egg Yolk Pork Ribs and Tenderloin with Broccoli are just as good. However, for groups as large as 10, the “Joy & Success” set menu might make ordering easier. Available 1st February to 2nd March, it includes yusheng, chicken feet, claypot chicken and steamed soon hock.